Utilising the benefits of vegetable protein. Most animals require protein for a healthy nutrition. The use of high-grade sources of vegetable protein offers a whole range of benefits. Vital wheat gluten is one of the most concentrated vegetable protein sources. It occurs naturally in all wheat and wheat-derived flours. As an important source of glutamine it contributes significantly to the development of the intestinal absorption surface. RemyPro is a concentrated rice protein source, with a biological value that is higher than most other plant nutrient sources. BeneoPro W is the brand name for vital wheat gluten by BENEO. 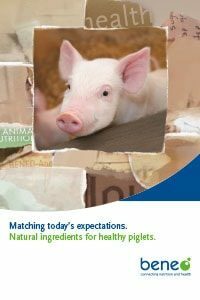 As a safe, palatable and highly digestible protein source it is the ideal solution for the diet of young animals (piglets, calves, poultry). Furthermore it is a highly concentrated protein source for aquaculture and improves the technical characteristics of wet and extruded petfood.